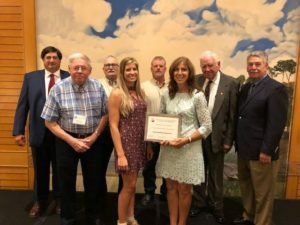 Frederick SCD congratulates Dave and Carole Doody and family on being selected 2018 Outstanding Cooperator by the Maryland Association of Soil Conservation Districts. They received their award at the MASCD Summer Meeting held in Cambridge, MD at the Hyatt Regency Chesapeake. Pictured are Carole Doody and Carissa Doody Adams with the Frederick SCD supervisors Bobby Myers, Roger Troxell, Gareth Harshman, Scott Hipkins, and Bobby Rakestraw, and district manager Denny Remsburg. Frederick SCD also received the Attendance Award and Rakestraw was recognized for 10 years of service as a supervisor.